I'm not really a participant in the Sunday Salon series, but it's been a while since I updated, so I felt it was due. I finished Katherine Neville's The Fire a week or so ago. Since then, I've been bringing myself up to speed on back issues of magazines that I put off in trying to finish The Fire. I've now picked up a book again, though: Angela Carter's Shaking a Leg. This book is a collection of her journalism and other non-fiction writings - literary criticism, essays, etc. It's been a LOOOONG time since I read a non-fiction book...almost a year, since I was reading Defending the Damned last September during my sister's wedding. So I thought sprinkling in a little non-fic would be good. I've never read any of Carter's fiction, but I've heard nothing but good things about her. I'm looking forward to diving in to this book! HOWEVER, I'm not sure much reading will get done over the next couple of weeks. Ricky and I are moving into a new house, and I am starting my new position (well, it's a lateral transfer, really) in a different office...it's going to be hectic, to say the least. We've already started packing and moving a few things...our lease here is up on the 31st and our lease in the new place started yesterday, so we can move a little at a time. I HATE moving. I always swear to myself that I won't do it again for X amount of years. But we've been unhappy with our current apartment for some time; we've wanted to get into a house; the rent here is going up; I got transferred...seemed like the right time. And so we go. The plan is to stay in this place a couple of years, pay down our...ahem...substantial...debts, and save some money to buy a place. I hope that happens, so we DON'T have to move again after that for quite some time. Hope everyone is enjoying their reading! Have a great weekend! 1. Perdue Perfect Portions chicken breasts and frozen vegetables make a quick and easy dinner. 2. Shaking a Leg by Angela Carter is the book I'm reading right now (or at least it will be, when I get back to reading). 4. My irritation was obvious. 5. They say if you tell your dreams people will think you are crazy. 6. Give me time to think it over. 7. And as for the weekend, Friday night I was looking forward to dinner with my husband and mother-in-law, today my plans include maybe getting together with some friends and Sunday, I want to do something I enjoy! 1. The last thing I ate was a cinnamon-raisin English muffin and Brummel and Brown spread. 2. A new dress for a wedding is something I recently bought. 3. When it rains, it makes me want to curl up under a blanket with a good book. 4. Ricky was the first person I talked to today. 5. Hugs are healing when you're sick. 6. I would like some extra comfort today, since I have a nasty cold. 7. And as for the weekend, Friday night I was looking forward to looking at rental houses, today my plans include my friends' wedding and Sunday, I want to look at more houses! The Fire is the sequel to Neville's book The Eight, which I read over my Christmas break this past winter. I was sent this book to review by the kind folks at Random House/Ballantine. I cannot recall if it were a LibraryThing request or if the publisher simply sent me an unsolicited copy. This novel picks up twenty-some years after the events of The Eight. Cat Velis, the hero of that novel, now has a daughter, Alexandra, who early on showed some prowess at chess, but has since left the chess world altogether. It begins to appear that The Game, put to rest at the end of The Eight may have begun again. It's up to Alexandra to stop it, with no help from her mother, who has disappeared. The book follows Alexandra on her trip around the world, trying to piece together the puzzles left for her by her mother, attempting to once again bring The Game to a halt. Interwoven with Alexandra's quest are scenes from 1822, where Lord Byron's illegitimate daughter, Haidee, races to hide the Black Queen from those who would use it for harm. This book was nowhere near the follow-up I would have expected. I had hoped for something in the same vein as The Eight, with pulse-pounding car chases and a fascinating series of events leading up to the ultimate conclusion. I just didn't find the action in this book as compelling. I barely found the action at all. There was too much Middle Eastern history, not enough car chases. There, I said it. I love a fast-moving plot. I can sacrifice a fast-moving plot for good character development. Unfortunately, I didn't feel that this book had either. I found myself skipping over the history lessons, since I have no interest in Middle Eastern history, trying to get back to the part where Alexandra DOES something. I also feel that the ending was rushed. There was a lot of build up to what little action there was, then it was like we dropped off the edge of a cliff to the end. The romance was barely believable, since the characters met each other, spent a couple of hours together, were then separated for several days, and then reunited, only to find that they were in LOOOOVE. Maybe the final version has some significant plot changes; otherwise, I can't really recommend this one. It wasn't necessary to re-open the storyline of The Eight. I'd give it two and a half out of five Whatevers. Read The Eight instead. Well, plans have changed a little. Things happen for a reason, I'm sure. The Husband and I were quite disappointed a few weeks ago when we found the CUTEST house to rent in the neighborhood we love, and someone rented it out from under us. We kept diligently looking (the lease is up at the end of the month), but couldn't find anything we liked in our price range. Just as I was giving up, thinking we were going to have to rent a condo instead of a house...work surprised me by notifying me of a transfer to another office. This transfer solves several problems for us. Number one, it will be a good change for me. I've been in my current office for over two and a half years, and it's started to get a bit stagnant. I like a good shake-up every once in a while. Number two, it solves the housing dilemma for us. The county where I'll be working has much more affordable rentals (and many more of them than our current county does). We'd debated moving there, but at the time, it didn't make sense since we both worked in the county we live in now. With my transfer, we feel a little freer to go ahead and move up there. So now we have SO many houses to choose from, and they are much more affordable. Hopefully, in a year or two, we'll be ready to buy...if the market is still favorable. 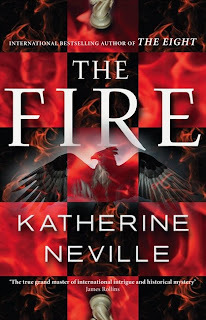 In reading news, I'm ALMOST done with my current read, The Fire by Katherine Neville (which I've been working on for QUITE a while). I have about 30 pages to go, and I think I'll be able to finish it up tonight. Then I've got some magazines I want to catch up on...the last couple of months have been VERY slow for reading, even for me. And now I'm off to finish up on the internet and read those last 30 pages. I hope to have a review up later this week! 1. When I heard that Michael Jackson had died I did not believe it. 2. FOOD is the best medicine. 3. It's late, but better late than never. 5. My eyes have seen too early an hour this morning. 6. I believe in what I do, strongly. 7. And as for the weekend, tonight I'm looking forward to dinner with some friends, tomorrow my plans include a Fourth of July party thrown by a friend AND looking at a house and Sunday, I want to visit my mother-in-law and Barnes and Noble and maybe buy some new books!